Bold, modern and contemporary, our lovingly handmade square photo lamp shade can make any room look chic. Available in two styles for either the ceiling or table, & printed with your photos, they bring character to the home. 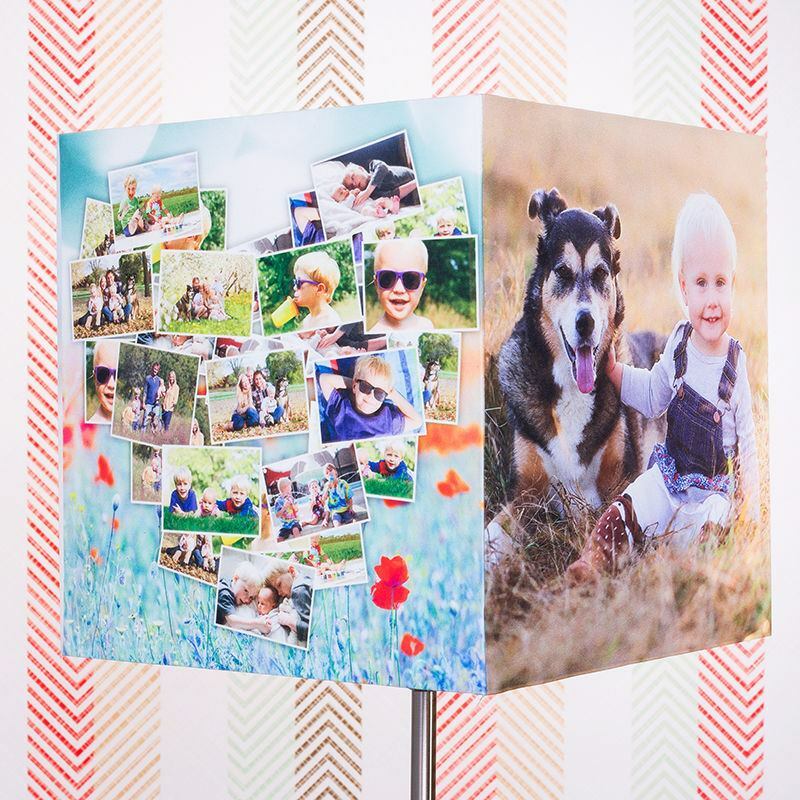 Personalise each side with your pictures or design to make a truly bespoke photo lamp shade. Create an attractive feature and instant talking point with a personalised square lamp shade. Our semi-translucent textile back-lights your design allowing it to shine through, whilst remaining vibrant even when switched off. Cool and contemporary, the square photo lamp shade is both beautiful in daylight and magical when illuminated at night. Extremely intuitive process for uploading images, and very helpful when needed to change the order (before production started). Packaging and delivery was good, and am very pleased with my favorite images on the Lampshade. A beautiful product. Thank you. Good quality card, would highly recommend. Each side of the photo lampshade is 30 cm x 30 cm, giving you plenty of space to fill with your favourite photos and memories. Like many of our products, the photo lampshade comes with a quantity discount, so give a few rooms in your house a contemporary touch and save money today. For your safety: Fire rated personalised lampshade means that this shade is safe for your home. Fire rated material BS EN 60598 - 1:2008 650 Glow Wire Test (Clause 13.3.2). Maximum wattage 100w bulb. Cool energy saving bulbs are recommended. The textile we use is semi-translucent and slightly textured for an authentic feel. Backed with a fire rated inner lining, the shade is then attached to a white painted metal frame that will either sit at the top or bottom depending on which style you've chosen. Handmade to order by our team of skilled craftspeople, your photo lamp shade is truly one of a kind. Printed using our specialist process, the colours and quality of the print won't peel over time. Your shade will come with a removable adaptor to alter the size of the fitting ring. Each side of the cube lamp shade can be customised with your photos, design or text, so essentially you're getting four in one. Give each side a different theme so you can turn the lamp shade around to suit the mood or how you're feeling. Print one side with a family photo and the others with friends, pets and a special holiday. This means you've got a lampshade that features all the things you love. You can also create a photo collage on each side too. Tip: You can press 'Copy Side' in our design tool if you want the same design repeated on all or certain sides. You've probably used the panorama setting on your camera or smartphone, but not known what to do with the photos. The square lamp shade is the perfect way to show off stunning landscapes. Section your panorama shot into four parts, and print them all the way around for a totally original design. Photos aren't the only things that look fabulous. Match your home décor and living space with block colours on each side featuring a symbol or pattern that means something. Whether it's a football club emblem or artistic pattern, you can really create something unique to you and your home. Make a loved one's birthday truly memorable by designing your own lampshade gift. A nostalgic route is super touching so gather old snaps together and create a photo collage that won't fail to bring a smile to their face.